Enjoy your stay with us even more by checking out some of the most popular area points of interest and local area events happening in or near Long Island City. Chase the links to explore the local region even more. The Museum Mile stretch of Fifth Avenue offers the city’s biggest free block party and admission to eight NYC museums, including the Metropolitan Museum of Art and the Guggenheim. For 11 days, this annual NYC festival features a number of music, dance, theatre, and visual-arts performances to various venues, like Rockefeller Park and Governors Island. Performance times vary date and location. 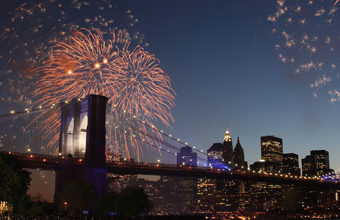 Celebrate our nation’s independence in the Big Apple with a dazzling fireworks show, lighting up the skies along the East River and Brooklyn Bridge. The event is free. Start time is TBA. Dedicated professionals perform the Shakesparean class, “Cymbeline,” at Delacrote Theater in New York City. Tickets are free, show times vary by day. This festival features two weeks of eclectic performances – including musicals, experimental pieces, classical revivals, and more – at various venues in the Lower east Side and East Village. Show times vary by date and location. Sample some of the finest handcrafted beers and wines New York City has to offer at the Brooklyn Beer & Wine Fest, hosted at Restoration Plaza. Celebrate all things “cool” during this three-day festival, held at Marcus Garvey Park and Tompkins Square Park. The festival includes performances dedicated to jazz pioneer Charlie Park.